This is one of the easiest ways to use up vegetables. In this case I actually used the leftover vegetable mix from [saffron vegetables and crispy rice], but you can use whatever fresh veggies you have on hand, or even frozen veggies in a pinch! Try pumpkin and sage, broccoli and sausage, or even frozen peas! 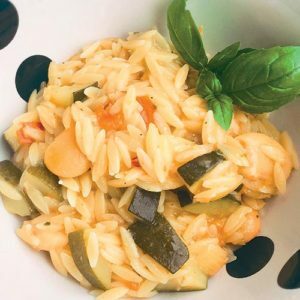 The basic concept is cooking orzo pasta as you would risotto. Chop the onion and garlic, and sauté in olive oil with a bit of salt and pepper over medium heat. 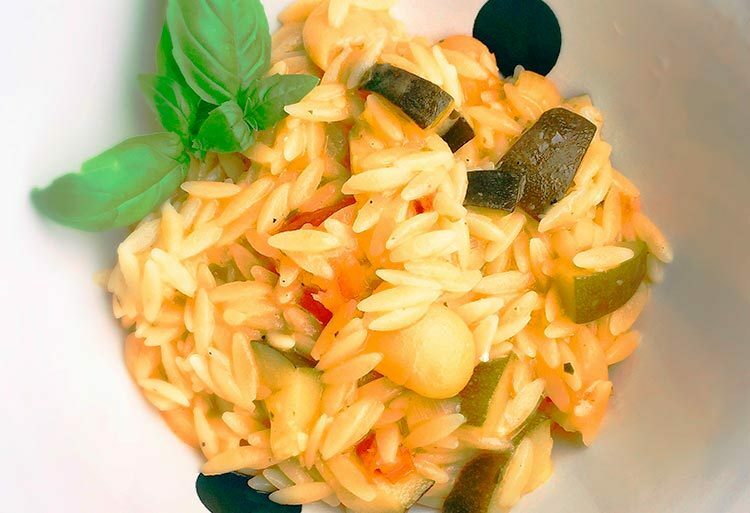 Throw in the orzo, and continue to stir, until all the pasta is coated. Stir for a few minutes, before adding a splash of white wine. Continue to stir until the wine evaporates, and then add the vegetables. At this stage add bit by bit the broth, and cook on a low heat. The more patient you are the better this will turn out. If you are starving and in a rush you can pour in plenty of broth and crank the heat. Taste the pasta as you go, until it reaches your ideal texture. Pull off the heat and throw a heap of parmesan in. Mix up, and serve with additional parmesan to top.